Previous How to select best Inverter? 2) I filled my Lead Acid Battery with distilled water on Sep 11, 2013. Today, after 14 days the level of water in the battery is in middle of HIGH Level mark and LOWER level mark. Is it fine? I mean dropping level of water from High Level to nearly Low Level in 14 days? or my power inverter is destroying the battery? The battery is being used for supplying power to tube lights, fans at times of electricity load shedding. 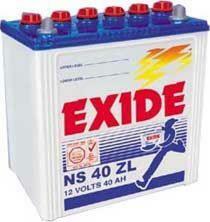 Deionized water is best for the battery.If it is not available, you can use battery water / distilled water. Constantly monitor the water level. If the battery is aged, heat may develop during charging which vaporize the water.If the Tubular battery is a good one,water topping once in 6 moths or more is sufficient.